Since he first appeared on the literary scene in True Detective, hardboiled Chicago PI Nathan Heller has tackled some of the toughest cases the Windy City has to offer. 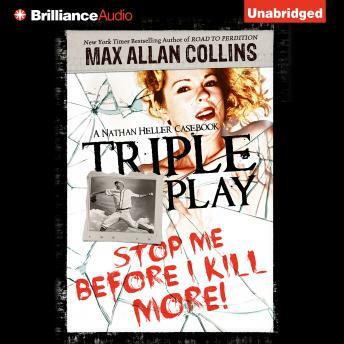 Now the gumshoe returns in Triple Play: A Nathan Heller Casebook, a gripping collection based on real cases of the 1940s, '50s, and '60s. In Dying in the Post-War World, Heller returns from combat to find his marriage a shambles and himself square in the middle of the notorious Lipstick Killer case of 1946. Kisses of Death follows the PI into the 1950s, when he is hired to guard Marilyn Monroe. The famous starlet's intellectual pursuits eventually lead to Greenwich Village and the grisly murder of an early beatnik. And in Strike Zone, Heller is hired by baseball boss Bill Veeck to investigate the 1961 murder of a famous pinch hitter whose private life will pull Nate into a dangerous new world of little people and big sins. Heller's trademark cynicism and knack for keen social observation are on full display in this trio of short novels, offering a gritty insider's look at some of the twentieth century's most shocking crimes.